Coffee, one of the world’s most universally beloved drinks, offers a taste of local culture with every sip, in whatever form it's served (small but strong, organic and Fair Trade Certified, topped with whipped cream, or spiked with whiskey). Inspired by cool fall temperatures, here we spill the beans on five destinations where caffeine-craving travelers can get their fix. Vienna: The coffeehouse, or Kaffeehaus, is as much a staple of Viennese culture as the waltz and opera. In recent years, the number of traditional coffeehouses has dwindled as owners face competition from modern chains (yes, Starbucks has several locations here) and increasing real estate costs, but enjoying a cup is still a must-do during a visit. From decades-old institutions with soaring ceilings and immaculately dressed waiters to boho-hip joints that draw a young crowd, you can find the perfect spot for any sipping style. Can’t-miss spots include Café Sperl, a gorgeous architectural gem that has been around since 1880; Café Sacher, known for its decadent Sacher-Torte; and Café Landtmann, with live music, a celebrity clientele, and live music. Seattle: Credited for kicking off the dual trends of the gourmet cup and café culture in the United States, the Emerald City is beloved among java junkies, both its cup-always-in-hand Seattleites and the caffeine pilgrims who travel here for a tall Frappuccino from the first Starbucks, a Pikes Market institution that’s been brewing up beans since 1971. Starbucks can be found all over the city, of course, but Seattle’s coffee culture thrives in its dozens of indie coffee shops, especially in the the Capitol Hill ‘hood. A few perennial favorites: Espresso Vivace, known for its for its devotion to quality; and Victrola Coffee, an art deco spot where you can catch live music or art shows while enjoying a cuppa. Or try a coffee crawl by tour operator Seattle By Foot. Costa Rica: Costa Rican coffee is world-famous – and even more enjoyable to drink in the country where it hails from. But you don’t have to drop thousands of dollars staying at a high-end working coffee estate to get a taste for the country’s rich coffee culture. Coffee plantations can be found just about everywhere, offering a great way to learn about the history and production of this all-important bean for about $20. A few of the most popular plantations that offer tours: Café Britt, Espiritu, and the Doka Estate. Spain: Spaniards love their coffee – evidenced by the several they drink daily and the massive, omnipresent coffee machines in every eating establishment. But while the coffee culture is pervasive, it can also be confusing, especially for newbies. The most popular versions, Spanish style? Café solo, a shot of espresso; café cortado, a solo with milk added, and café con leche, which is half-coffee, half-milk, usually the drink of choice during breakfast. 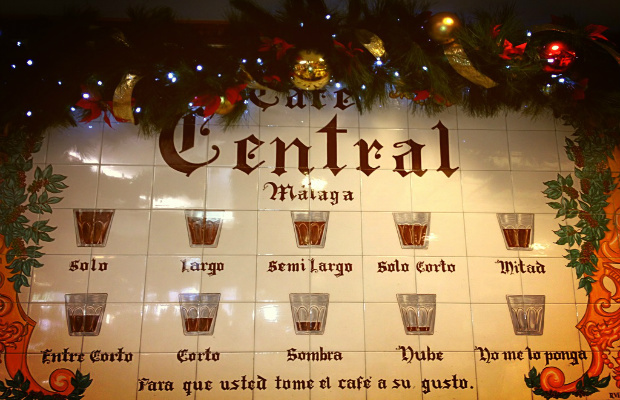 There are plenty of regional variances, however – the sign pictured above highlights some of the ways you can order a cup in local café in Malaga. And if you’re looking for a decaf, be sure to ask for a descafeinado de maquina – a decaf made by machine – unless you fancy an instant coffee poured into a cup of hot milk, that is. Colombia: The country’s problems with drug trafficking and violence have improved in recent years, and with that, tourism has also enjoyed an increase, with many visitors coming to explore the home of what’s often recognized as the world’s best coffee. The epicenter is Eje Cafetero, also known as the “coffee crossroads” or “coffee triangle,” located about 100 miles west of the capital city of Bogotá and made up of the states of Quindío, Risaralda, and Caldas. Visitors wanting a more tranquil (and budget-friendly) experience than the hustle and bustle of bigger cities will find a quiet oasis in this area's guesthouses located on coffee farms or in small, charming towns such as Salento.